I’m not sure how I feel about this quote anymore. As a realize I’m not the wide-eyed 24-year-old who set out to “see the world” anymore, that I’m now actually a 31-year-old with very specific goals and concerns, I think safety is now a big issue for me. Especially since I’m a solo traveler. It started with me going to a nearby church for New Year’s Eve service. I got there at 10pm, I left a 1am. There is a taxi stand across the church, but it was closed. I have a roommate who could’ve picked me up, but his sick dad was here and he’s been tending to him for weeks. The worst thing I could’ve done, I thought,was ask him to leave his dad alone in the house to “pick me up.” I made a judgement call to walk home. Looking back, I really didn’t have a choice.I usually don’t walk. Usually I’m traveling from Central Accra and take a taxi home. But I was so close to home, I had no choice but to walk. I don’t feel like re-calling the details. And in the grand scheme of things it could have been a lot of worse. But pretty much, I was almost home; just in front of the mosque nearby. It was here I had a rough encounter with two men and a couple of machetes. Like I said, they barely touched me except to get my bag and phone out of my hand. And it could have been a lot worse, even fatal. I’m sad to say this is not my first time getting robbed abroad. It’s actually my third. And no, I’m not one of those “stupid tourists” who leaves their bag somewhere thinking its going to be safe. I was robbed at gun point in an Internet Cafe in the middle of the day in Costa Rica. My home was burglarized in Mexico. And now this (Shout out to China… never got robbed there, lol). I’m not sure traveling is not the answer as people have been suggesting to me the past week. It’s true that I was never robbed in New York, or anywhere in the US for that matter. But we all know I could’ve been. My mom is scared now and coming from a developing country herself, she remids me of the “lawlessness” that can happen. The area I live in Accra is not patrolled. My neighborhood in Queens New York? A cop car pretty much lives in my neighborhood at night. I digress, but it’s helpful to have a conversation about being safe abroad. All to0 often we highlight the beauty of travel, without talking about the risks. Here are some things to keep in mind for keeping safe when abroad, or I guess anywhere. This can begin even before you leave for your trip. Registering with your embassy helps them getting in contact with you or your family in case of an emergency. If you’re a US citizen, you can register at the Smart Traveler Enrollment Program (STEP). Carry as little items as possible is what I shoudl say. I was smart enough this time around to only have one debit card on me for withdrawals. I stash the rest in a safe place at home. Trust me, it s a headache when you’re abroad and you literally have nothing. This should read, carry as little items as possible when going out. I had one debit card I carried to make withdrawals. The rest stayed in a safe place at home. So I didn’t have to go through the headache of calling all my banks to alert them of my stolen card. And as far as other items, I know the US embassy has no mercy on you when you’re passport is stolen. You still have to pay the price to get a new one. And I’ve heard some other countries embassies pretty much interrogate you when you lose your passport as they think you’ve sold it on the black market. If you don’t need it, keep it at home. Something thats helped me ease into life abroad in general as well as in troubles situations was to have a “family” abroad who looks our for you. This can even be one person like a roommate or friend. My roommate was instrumental in calming me down, taking me to the police station, and letting me borrow things until I recovered mine. Ideally you should tell someone where you’re going to be at all times. This my be virtually impossible if working abroad, but if possible switch up the times you leave your home. Lesson learned. From now on, if I can’t take a taxi home, I just won’t go. Go to areas where you can easily get a taxi, or find out beforehand if you’re taxi driver is able to pick you up. If possible share rides with friends. Call or text your friends when you get home. Anything could’ve happened that night. But because I was lucky enough to only encounter petty thieves, they wanted my things and move on as quickly as possible. In the event that you do get robbed, don’t struggle. Whatever you have is not worth it. And they can be eventually be replaced. What are some tips you use to stay safe abroad? Share your thoughts on safety abroad. Safe travels! glad you got away with no physical harm… stay safe, dear. Thanks Jo! Hope all is well in Germany! I’m glad you were not harmed, but sorry to hear you got robbed. I always felt safe in Accra, even late at night. When traveling on the roads at night in the countryside, however, I was mindful of the possibility of attacks by bandits. During a trip up north to Tamale in 2011, I read about a bus full of school children being stopped and robbed on the road. You are a seasoned traveler, so it appears you have taken the incident in stride. No doubt it could have happened anywhere. 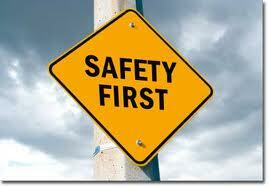 Nevertheless, your recommendations for keeping safe are absolutely essential. I need to heed one of them going forward that I’ve neglected to follow: registering with the US Embassy. For my next trip (I’m heading back to Cuba in May), I don’t think it will do much good. On the other hand, it’s one of the safest places I’ve visited. I’ve been keeping up with you on Twitter. I love the work you’re doing.